The Commodore Amiga 4000, is the successor of the Amiga 2000 and Amiga 3000 computers. The A4000/040 was released in early October 1992 with a Motorola 68040 CPU. The Amiga 4000 introduced the Advanced Graphics Architecture (AGA) chipset with enhanced graphics. The Amiga 4000 comes in a desktop style case, a bit smaller than an Amiga 2000. The keyboard is essentially identical to the CDTV’s keyboard, but mouse is a more rounded “beetle” style mouse, instead of the more angular 2000 mouse. The Amiga 4000 was a quiet machine compared with the Amiga 2000 and Amiga 3000 from Commodore. The operating system originally boots in 640×200 mode, however, the AGA chipset in the 4000 supported many other higher resolution modes. Using the “SUPER72 Super HighRes Interlace” mode, the system offers a solid display of 900×630. 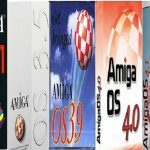 The Amiga 4000 included a new release of the Amiga operating system, release 3.0. The Amiga 4000 presented a significant expansion in the capabilities of Amiga computers in 1992, and was used in many many movie productions and gave the Commodore Amiga a new breath of life, with improved graphics and speed capabilities.